Exxel Pacific coaches specialty contractors on safety programs, policies and culture. The company is building an office campus at Southport in Renton. Exxel Pacific earned the grand award for safety excellence for its demonstrated innovation and leadership in construction safety. The company forms a collaborative partnership with its specialty contractors that extends to every aspect of its structure — production, quality, and most important, the company’s employees. An integral part of these partnerships is the coaching and mentoring of specialty contractors on their safety programs, policies and culture. Every safety program and practice that the company establishes is done with a diverse specialty-contractor base in mind. 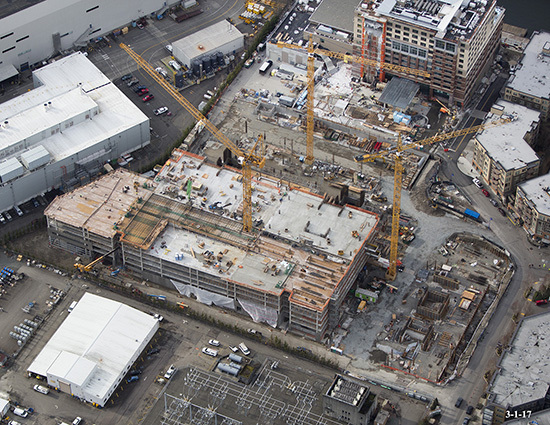 A specialty contractor does not need to have a big safety budget or a large staff to follow the Exxel Pacific Safety Management System — simply a commitment to roll up their sleeves and do the work. An example of Exxel Pacific’s safety innovation is its use of the iAuditor safety-inspection app. The company created its own safety-inspection template, which it shares with project partners for use on smart devices. Another app the company uses and promotes, WA-HSEQ, allows users to create accident and near-miss reports to document safety issues to be addressed, and to recognize good jobsite safety behavior.